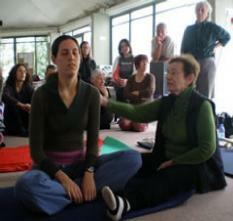 Mia Segal, Moshe Feldenkrais's first student and assistant for many years, feels it to be her mission to transmit the Method to future generations of Feldenkrais teachers in its purest form. Her main emphasis therefore, is precision. The first time I experienced Mia's teaching was during an intensive public workshop in Oxford (1989) where I suddenly had the extraordinarily pleasant feeling of wearing nothing but silk. Another sensory image that came to me on that occasion was that of a fish taken from the polluted river Thames and released into a clear mountain stream. Learning is what you do when you don't know what to do. Learning to learn, or the development of learning- power, is getting better at knowing when, how, and what to do when you don't know what to do. Mia herself simply says: What we do is returning people to themselves. After 18 years of Feldenkrais experience and 15 years of studying with Mia, I feel confident enough to point out some of the principles and strategies that characterize Mia's way of 'teaching' awareness. 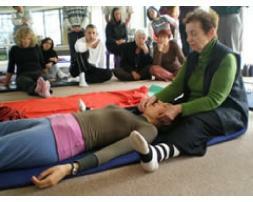 In December 2003 I attended an advanced course for practitioners at ACCORD MOBILE , Myriam and Sabine Pfeffer's Feldenkrais Centre in Paris where Mia had been invited to teach for three days. The following article is based on the notes I took whenever I could, and as best as I could. What I hope to convey here is an impression of the learning environment and learning culture which Mia created in order to communicate what can neither be taught by rote nor through theoretical deliberation: how to become aware so that one begins to know what one is doing and succeeds in finding effective ways of matching intentions and actions. "Remember, if something goes up, something else must go down..."
The workshop started and finished with the familiar checking of weight distribution, quality of breathing, of turning to the right and to the left while standing etc, scanning the contact when lying on the floor (in particular sensing the entire length of the spine from skull to coccyx and back up again), and the two reference movements described below. These served as a kind of "guideline" throughout the course providing repeated opportunities for monitoring and assessing what was gradually becoming clearer and easier, i.e. what was actually being learned. On the first day, the invitation to lie on the right side sent quite a few participants in search of a comfortable support for the head. This somewhat automatic reaction surprised Mia who responded to the sudden interruption by saying that people would soon find out why it might be better not to have a pillow in what was to come. During scanning in side-lying the right arm was extended in front while the left hand was placed somewhere comfortable between the chest and right arm. - Lifting the head fractionally off the floor, sensing its weight, the amount of effort required, where this movement was being initiated: "Do just the beginning to get clear how you actually start the movement", noticing parasitic movements: " Watch what you are doing with your mouth...jaw...tongue... eyes...", paying attention to the quality of breathing: "Do you breathe in...out...or hold your breath..." , and to different parts of the self in relation to each other, to gravity and the floor as support: "Remember, if something goes up, something else must go down..." . - The second reference movement involved lifting and then turning the head in order to look backwards over the right shoulder: " ...As you begin turning your head, observe how the pressure changes along your right side...". Again special attention was paid to breathing, effort, parasitic manifestations, the kind of limitations encountered etc. "Now go back to your places and watch how you do the movement"
These two little movements were then explored by a volunteer (and observed by everybody else from the outside as it were), followed by a second person who did them quite differently. The information gained in this way was not shared in discussion but directly fed back into the continuation of individual ATM work: "...How far can you turn your head without effort?...At what point do you choose to come back?...What tells you not to go any further?..." By the time a pair of volunteers were doing the reference movements simultaneously, participants began to make spontaneous comments about their observations. Thus the scene was set for what was to become an open-ended yet highly structured workshop where those who had come with particular questions and concerns were given a chance to take a more active role in shaping the event, "creating the path in walking" as it were. Mia's role consisted in making sure that people did not stray too far from the path of genuine learning as defined by Guy Claxton - by continuously providing the group with opportunities of thorough immersion in experience (for Claxton "immersion in experience" is the most fundamental learning mode throughout life). "I was particularly struck by the very clear and dynamic aspect of Mia's teaching which invites to action...What seems to me rather unique about her teaching style is the way of listening intently to the demands of the present moment, combining what is to be found in the situation with what she came to teach... Most trainers arrive with a very precise ready-made programme." The first of many little student-teacher dialogues (which unfailingly and very smoothly progressed from verbal to non-verbal communication) may serve as an example of the highly experiential-exploratory-interactive learning that was going to characterize the entire course. One of the volunteers had mentioned difficulties with lying on the right side and was now trying to explain her discomfort by saying that her 7 th cervical and 1 st dorsal vertebrae were 'stuck together'. "Did you have an x-ray done?" The answer was "no" but the doctor had told her so. "Do you believe that?" ... "I can't move there very much."... "Do you believe that?" The student said that her neck problem had been caused by a dance accident. Mia didn't let her go into a long explanation but asked: "Are you a dancer?" When the answer was 'no', the verbal part of the conversation came to an end. While the student started exploring the movement once again, Mia's hands quickly found a previously neglected place in the dorsal spine. As soon as her touch brought awareness to that area, it began to participate in lifting and turning the head. The student's belly (previously tightly drawn in) started bulging a little as the movement began to be initiated more from the centre. As the effort was more evenly distributed along the central axis the neck problem seemed to dissolve as if by magic. This was just one of many demonstrations of how futile discussion can be avoided and an individual's complaint dealt with in a very practical and direct way. A German doctor remarked that the art of turning such situations into genuine learning opportunities for all students is rarely demonstrated in training programmes. Ingrid felt that all too often people are allowed to go on discussing their personal aches and pains while the interest and attention of the group is being lost. At the end of the workshop Ingrid summed up her main impression: "I can see in Mia's work what I see in Moshe's FIs. Something is being touched in a particular place and the whole person is made to move. One's awareness is always kept on the whole person. What I found truly amazing was the fact that not a single joint was mentioned during these three days; it was always the WHOLE! That impression will remain with me." Another aspect that was particularly "liberating" for Ingrid was the fact that "occasionally touching in the 'wrong' way doesn't seem to be seen as a problem". Each such demonstration-observation-interlude much enriched individual ATM exploration of the reference and related movements; new approximations on the way towards finding alternatives to ingrained habits were experienced by all as everybody's awareness kept expanding thanks to first observing and then playfully but systematically trying out what it feels like to move as another person : "Observe if you begin to roll a little ... and also when that happens." "First lift the head and only then start twisting to look back... Now leave the head on the floor ... initiate the movement from the centre and only then bring the head into the picture... This clearly allows for much more fluidity and a greater range of movement..." etc. Occasionally Mia would address a particular person: " That's it, just don't roll so much but extend and feel how the ribs open..."
"Those neck vertebrae are innocent. Look...everything else helps them." After a break Mia began preparing the ground for FI work, showing once again how practitioners can use a "problem" presented by a client as a kind of launching pad for learning how to rely more and more on their own senses and thereby expanding the quality and scope of their own and their pupil's awareness. This time a combination of ATM and FI was being demonstrated. A person who had complained about difficulties when lying on the right side was asked to lie on her left, which proved to be no easier. The student was apprehensive of losing what had been gained before the break and Mia took this as an opportunity to assure all those who had come with specific questions, 'problems', and 'pains' that nobody would get hurt while everybody would learn something for their own practice. After gently softening the student's chest where the stiffness of her shoulders seemed to originate, Mia got her to explore new degrees of freedom while lifting and turning the head over the left shoulder. Attention was drawn to the clavicles coming closer to each other whenever the student allowed her right shoulder to drop forward, causing her whole body to roll a little in the same direction. Invited to roll intentionally, slowly at first and then more lightly and faster, she could feel that this movement was actually mobilizing her left shoulder most of all - and gradually freeing up the supposedly 'stuck vertebrae'. Mia commented: " Those neck vertebrae are innocent. Look, they stay the same and everything else helps them." A kind of 'Self-FI' while lying on the left involved playful investigation of crucial aspects that might be missing in people's kinaesthetic self-image. Gently palpating both sides of the sternum with the idea of making out the contours of each pair of ribs; exerting a little pressure to find out in which direction the ribs yielded most easily etc. ; softly rolling the head with the left hand while lying on the right side; continuing the same movement while consciously bringing the eyes into the picture and observing how much further elbow and shoulder could go backwards as a result etc; exploring how the chest might be coaxed into yielding a little more while lying partially turned backward with the left arm supported by the floor or the body. Here it was a matter of observing the effect when applying gentle pressure in different directions from various points along the right side of the sternum. Afterwards mobility and ease of movement were visibly increased throughout the room.
" You are your vertebrae...You are your back!" - "It's all about awareness!" The demonstration that followed (involving difficulties in turning from lying on the back to the side) focused on the importance of noticing how we use language and can become more skilled in listening to how we express ourselves - both in words and non-verbally through the quality of our touch. It became tangibly obvious that there exists a living relationship between the kind of language we use and the way we perceive ourselves and our world. Giving students ample opportunity to study the complexity of this subtle relationship probably constitutes one of the keys as to why Mia's educational approach is so effective. Michelle, a recently qualified Feldenkrais French practitioner, wanted to find out why she was getting stuck every time she tried rolling from the back to lying on the side. She was promptly invited to lie down and do just the beginning of the movement she was talking about. When Michelle reached the limit of what she could do, she stopped and explained: "I know I have a stiff spine. I can't move my vertebrae." 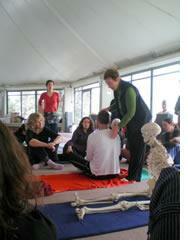 " Your vertebrae move perfectly well, but you don't know how to move... You are your vertebrae, ... you are your back." As Michelle kept 'trying' again and again, Mia suggested: "Look when she stops breathing.." and to Michelle: " Say 'ouuuuu' as you roll" . That instantly made a difference: " Now she is beginning to move where she didn't move before... and not 'now she is moving her back or her vertebrae'..." As Mia placed her fingertips on each side of the dorsal spine just above the lumbar, the student's entire central axis began to participate in the movement. All of a sudden rolling to the side no longer seemed to present an insurmountable problem: " Now you are rolling !... She didn't know that she usually doesn't feel her back where she isn't moving, forcing elsewhere instead. We can see it, but she doesn't know what she is doing... It's all about awareness ! " As so often in her teaching, Mia took this opportunity to point out that once the necessary work is more evenly distributed the whole begins to participate in the action, and this results in a noticeable improvement of quality and ease - which can clearly be perceived as an objective fact by any attentive observer, while the person doing the movement subjectively experiences an undeniable reduction of effort (and probably also of pain). While the reference movement seemed relatively free and easy now, Michelle's nose stayed very close to the floor when turning to look backwards (This was actually the case for many other people at this stage). However, as soon as her attention was invited to include parts that were not yet participating (for instance the right knee stayed 'glued' to the left), the difficulty of lifting the head a little higher while turning to look over the left shoulder was greatly reduced. "If the upper knee begins to move it is a sign that the distribution of effort is more complete..."
The following morning I shared a lift with Michelle whom I knew from one of Myriam's training programmes. As we were going up she said: "I feel so much better! When I woke up this morning I sensed for the first time in my life that I can let go of some fears...When I entered the building just now I suddenly felt tears running down my cheeks." "How is your touch? ... Would you like to be touched like that?" A brief 'Self-FI' was another step towards partnerwork. Mia had us lying on the back, feet standing, knees pointing to the ceiling, while exploring the edge of our own occiput with gentle fingertips, especially where the cervical spine meets the skull, then gradually continuing down the cervical vertebrae (palpating mainly the lateral processes) and as far beyond c7 as we could easily reach. "How is your touch?...Would you like to be touched like that?" The same exploration was then undertaken with a partner: "You can touch as if you were whispering [here Mia actually reduced her voice to a whisper] or shouting [raising her voice] or something in between to be clear about what you are doing...Remember it's about communication!" "You need to make your intention clear without talking." While this was being explored in partnerwork Mia's voice could occasionally be heard: " What are you doing with your jaw...mouth...tongue?" ... "Please don't talk together in words...." A few times she addressed a remark or suggestion to a particular individual: "Don't turn him so much forward, instead lengthen a little more..."
"Observe how you mobilize the whole of yourself now in order to look over your shoulder"
The first day finished with a recapitulation of the two reference movements followed by observing differences in lying on the back, standing, and walking. Snatches of conversation overheard as people were getting ready to leave conveyed excitement about having been challenged in unaccustomed ways, and especially about everything having been so very practical and concrete. Some people appreciated particularly that talking had been kept to the barest minimum and that Mia's voice had not been mediated through the usual technology. Others regretted that it was not preserved on tape. There was also considerable perplexity that Mia never used a table which most students get used to in their training programmes. "Mia students", on the other hand, learn from the beginning that all they need in order to be good practitioners is a pair of sensitive hands and professional skill, including first and foremost flexibility of body and mind, manifesting in what Claxton calls the "three Rs" of lifelong learning: Resiliance, Resourcefulness, and Reflectiveness. The remaining two days challenged and cultivated our capacity to continuously shift range, focus, and intensity of attention as we were impelled to switch from self-observation in ATM and self-FI, to observation of others, followed by monitoring and eventually guiding their movements with our hands, while listening to the kind of language we used in the evolving non-verbal communication process and keeping an eye on our own organization. The second day started with: "Any questions?" The consensus seemed to favour one particular theme: how to observe what a pupil/client really needs when s/he complains of discomfort, restricted mobility, and pain, and how to find an adequate response. Lara mentioned a sense of severe restriction and some pain at the base of her neck and asked: "What do you do when a person comes with this kind of complaint?" "And still you say: what shall I do?" That question sparked off an amazing game involving the onlookers in mentally switching roles between pupil and practitioner all the time, once using their capacity for empathy to imagine what it would feel like to be the person who experiences a specific problem, and then pretending to be the practitioner who doesn't quite know what to do, while simultaneously focusing on the interaction between the two FI partners (without neglecting to be aware of their own reactions to the scene unfolding before them). It was fascinating to witness the creation of what might be called a 'participatory reality' for all (or at least for those who were genuinely present to this interactive learning process).
" So, what would you do?...First you listen to them. You look at them... and still you don't know what to do. You look for the thing that stands out most clearly, for instance something that is unusual. That you can do because all of you went through a training and learned to feel yourselves, so you have a certain idea...such as feeling the floor, becoming aware of the horizon. You all have your own experience... Now watch Lara and ask yourself: 'How does she feel her feet on the floor? How does she feel her weight?' [Mia asked Lara to turn so everybody could look at her from the side] Can you get any idea about her spine, her neck...? [asked Lara to turn her back to her colleagues] ...Any ideas?... and still you say: 'What shall I do?'... The next thing is you look at her in movement: 'Is it easier for her to move to the right or to the left? Does she look more to the floor or up? '...Notice to which side she turns more easily to look round...which foot she is standing on when turning to the right... to the left. Is she more steady this way or that way?...and you will see that both ways she is standing on her right foot. .. and you still don't know what to do ... [asked Lara to raise her arms a little] ...Look at the distance of her right and left arm from her head...How about her sense of stability?...Watch in levels: feet, legs, pelvis, chest, etc.... [invited Lara to walk around the room] Observe her neck..., her shoulderblades move; they don't have to move in a spectacular way... But where does the movement stop? "How can I make her realize what is happening?" As she started guiding Lara's torso in different directions everybody could see that there was a degree of holding and stiffness: How can I make her realize what is happening?...Her horizon should be here instead of there [accentuated a little the subtle flexion pattern that causes Lara's gaze to be directed slightly downward] ...The whole relationship needs to change. You cannot change one thing alone...I can give her little cues - in NLP they would call that 'anchors' - ... now I will offer her many different choices. [Mia's two hands seemed to talk to each other as she explored what kinds of organization might also be plausible to Lara's nervous system.] ...Then I look at the clearest thing. For example, can you see the direction of your eyes? or how your weight is given to the floor?...This is something she can come back to, something she can internally reorganize in order to sense it again..."
• Next stage, when you don't see so much, make them lie down [Mia began rolling Lara's head from neutral to right and left] ...Which side is easier for me? ... Even if I didn't see any difference, now I feel a difference. In the middle, as you know, it is always excellent. Here [rolling Lara's head to the left] I can go as far as that... then I would need more force. To the right she helps me because otherwise I would have to use more force.... There are many things you could start with...Look for instance at the feet, the hands...The main difference, however, is in this area [pointing to the middle of the sternum and indicating the region between the shoulderblades] ...Check the neck vertebrae and below c7...This relationship with the chest is very powerful. That area has to do with weight distribution, walking... [Mia's hands reached the place where cervical and dorsal spine meet and began to explore the extent of mobility there; after allowing the head to tilt back, she gently extended the whole spine - first slowly, then fast and lightly until Lara's feet started to respond by slightly flexing and extending. This was followed by taking Lara's torso a little from side to side] ... I feel first of all that although it seemed very beautiful there is very little movement between the vertebrae because she doesn't differentiate between one and the next. She does use them but by holding them together...not because of some difficulty though...There are certain movements she inhibits...YES! That's better! [turning Lara's head a little to the right/left and then gently exploring extension with the intent of clarifying the diagonals] Look, when I do that, it goes all the way to your right hip, right foot...Now let's see on the other side...Here it doesn't go the same way...How does it pass through the pelvis, through the leg? [returning to the first movement with Lara's head turned left a little, and then once more to the second, with the head turned right] ...Look, it's not at all the same thing. Where can you feel that you can let go ...not to help me...but to stop hindering me...Oh, never mind...I see something, she feels something is different...that's enough." "Now is the time not to tell her what I see!" When Lara was standing again Mia asked: " Where do you feel any difference?...How about your horizon?...How about the weight of your body on your feet?... Now is the time not to tell her what I see... Her own experience may be quite different... That is the great advantage in Awareness Through Movement: internally something happens and I don't say: 'You should feel something like this or like that...' The maximum I can ask after an FI is: 'How is your horizon...how is the contact with the floor now?' ...I know that after a FI I feel the difference often hours later, sometimes in the evening, or even the following day...So, don't say anything...(in NLP language: By framing we close the opening.)" "Do people take responsibility?" - "Observe when they take responsibility for what they do"
" Don't talk...Show me...lie on your side and do the movement..." Once again there followed a riveting demonstration of the living relationship between language and experience which we simply have to take into account if we wish to do good work as Feldenkrais professionals. Pointing to the base of her skull and the region around c7, the student with neck trouble explained why she was in pain: "I feel very tight here and when I turn my head to look back my shoulder doesn't move." "Listen to her words! Do people take responsibility? 'When I turn ( responsibility ), then there is pain ' ( no responsibility ) ... Observe when they take responsibility for what they do. It is not tight from heaven, you tighten it... So our job is to say to her: 'How much is skeletal, how much is muscular? What can you do to change that a little? '...We don't go into why sometimes people don't let go - there is always a reason. Pain is sometimes a very good thing - and sometimes not... [sitting above the student's head, gently picking it up and initiating the movement of turning] ...Look, the movement is always innocent... [clearly modelling by her action that you have to stay in the easy range] ...Yesterday I said that the place where it hurts is the most innocent... [taking the head a little further round] ...the whole community is sabotaging,... [with a nod towards the entire length of the spine, ribs, pelvis, legs] ... Nobody is helping... " The student ventured a comment: "My breathing is blocked!" "Who blocks your respiration? You ... So do the movement either on the expiration or on the inhalation, so your respiration is not blocked. ...For me breathing is like a thermometer ... When she stops breathing it's either because I did something or she feels something... When it starts again that is also a sign of something happening... Look, her knee is starting to move." The woman began turning with much greater fluidity as Mia gave her a sense of previously unavailable directions simply by taking a tuft of hair on top of her head and guiding the movement from there. "Gradually you show people how to take responsibility"
While having a little rest before getting up, the student placed a hand on her sacrum and said a little plaintively: "This morning I felt very tight here." ... "Listen to what people say!...So gently you say: 'And do you think everybody got up like that this morning after doing the same thing yesterday?' ... So gradually you show people how to take responsibility." "When you do something with precision and clarity, a few movements are sufficient." The third day was introduced by stressing that our task is to support learning: "I am not here to cure you...I wish to show you a way to do things differently...so that any difficulty you had until now can change and get better...Is there is anybody who wants to improve something even if there is no pain ?..." "If you don't have all the possibilities, you actively inhibit something in yourself." Since nobody came forward immediately, Mia asked Marie, an experienced practitioner in her seventies, to serve once again as a 'client' as on the previous day. This time the emphasis was on clarifying habitual patterns and Mia repeatedly pointed out the (usually elusive) obvious: " If you don't have all the possibilities, you actively inhibit something in yourself. " As so often in Mia's work the role of the eyes was particularly highlighted in this connection. Tentatively moving Marie's body in small circles above the right, and then above the left foot, some difficulties were made apparent. To clarify what was involved, Mia invited everybody to join in by standing in the habitual way while describing head circles without, however, changing the weight distribution on the feet . Mia continued her commentary concerning Marie's pattern: "Something is uncomfortable if the weight shift doesn't happen... Maybe if she changes the way she uses her eyes ... [placing her right hand in front of Marie's right eye and after a while switching over to block the vision of the left while continuing the small circles] ...Oh, it's already different... [to the group] ...Try it with one eye closed...She says one always has a 'dominant leg' ... We are born with two legs, then we make a choice favouring one; but we can change that...You can do that anywhere - standing in a shop, in a meeting...and you can say: 'Oh, that's where it goes...' and nobody will know..."
Marie reiterated her overriding wish: to avoid having a knee prothesis (which her doctor deems necessary). It took a little while till she became aware that despite the pain in her right sacro-iliac joint and knee she keeps using her painful side consistently more than the other. Marie explained that by saying her right leg is longer than her left. Mia's response was as expected: " Do you believe that?" And sure enough things began to change as soon as Marie started sensing how she habitually uses her pelvis and back in standing... After some exploration Marie sat on a chair and Mia softly pushed from her right shoulder, saying " Now make it go to the left side of the pelvis...After she sits like that for a bit everything changes...her eyes, her relationship to the environment..." As Mia had explained earlier, this is mainly due to the fact that tension on the painful side was now being allowed to dissolve because more of the work was shared more evenly between the two sides. "The clearer we are, the clearer the message we give"
Here is a fairly accurate approximation of what Mia said in response to my question why Feldenkrais asked students to keep repeating the same movement over and over again, a strategy that could easily be miss-understood as 'pattern-drill': " Moshe's insistence on repetition is about the fact that we first work with ourselves...because we are not precise enough about ourselves...thinking about our breathing, the head, pelvis, sternum etc. while doing a movement ... We sense what we do...how the different body parts work together - the relationship between them -, where we hold... So we have to do it repeatedly... The same with FI. If we were really clear, we could get the person to feel with one single movement, but we are not, so we have to search ...The clearer we are, the clearer the message we give... For instance, to change her way of standing by getting her left shoulder to drop..."
With that reference to my habit of keeping the left shoulder raised Mia invited me to lie on my belly and start listening to what her hands had to say in response to my question about precision and repetition. What I experienced during the following demonstration went so deep that I can only recall a few details and comments. Sitting above my head Mia took the back and base of the skull with one hand and the chin with the other and showed that the intended extension (or 'pull' as most people call it) would not go through to the feet. " You can pull as many times as you like, it won't go through this way... [placing her hands on either side of my back] Look on the left side the ribs look like a hill, on the right like a valley..." But then she started twisting my neck and head in a most extraordinarily unfamiliar direction, and managed to extend my spine without the slightest resistance on my part . "If you have experience, look it goes right through to the feet". But that was not the end of the matter. Suddenly, without the slightest warning, Mia pressed an excruciatingly painful 'trigger-point' somewhere near the outer edge of the left shoulder blade and said with mock suavity (quite in keeping with the robustly affectionate relationship we have developed over the years): "You mustn't shout in front people..." With that she once again pressed the tender spot, this time keeping her right thumb on it a bit longer. The second repetition led to a clear sense of letting go and enormous relief. Mia returned to gently 'pulling' the head, this time without any strange contortion of the neck. The impact could be instantaneously felt and seen to go right through to the toes of both feet - and then alternately once to the right and once to the left foot, highlighting both diagonals: " Look, the hill on the left has softened and flattened." Back on my feet I felt much more balanced with the weight having shifted noticeably to the right. The left shoulder had dropped considerably by its own weight, and the resulting release of tension was dramatic and blissful. At that moment I was also completely clear about how to reorganize my whole body and stop myself going back to the old pattern that originated in a road accident at the age of six. "I am not interested in lengthening her head but in joining the whole body ... All I do is show her connections "
the student's head Mia explained: " I am not interested in lengthening her head but in joining the whole body... I go very gently, so I feel what I am doing...I could do it with force... But with experience I find a way...changing the angle...Each time it goes through another way...and now that I have tried all these directions, I go back to the first way...It's a little clearer but I can feel it stops in the hip area... [tilting the head] Now it goes through...and I can feel 'Oh, here's the pelvis...' That's the importance of the head... Mathias Alexander called it 'primary control'... Repetition is to make it clearer and clearer for her... Moshe said not less than twenty nine times...Now you feel it goes through to your feet"
"You know much more than you think... and you learn more every time." The theme was explored a little further with Claudine who complained of neck pain. Soon Mia declared: " Look, it's not the neck but the hip...and all I do is show her connections." When a new pattern emerged as Claudine began to shift her weight fully to the foot on the side to which she was turning, she said regretfully: But on my own I don't find it." "That's why you came to me. I want you to realize that you know much more than you think and that you learn more every time. You think I know everything? There are people who know much more..."
Questions such as "Why pulling or lengthening rather than pushing or compressing?" led to more valuable information - embodied mainly in non-verbal answers. At this point in the process Mia encouraged everybody to become a little more active: "Can anybody guide her?...Say what you see...What's her relationship to gravity?...to the ground?...Where does she put her weight?" An animated dance-like interaction between a number of practitioners followed where Mia played the role of "prima inter pares" whose guiding questions, helpful hints, occasional interventions, and commentaries accompanied this trial-and-error phase. "Can I reproduce in her what she felt when she was moving with the whole of herself involved? " " The lighter the touch, the more you feel ... In this non-verbal vocabulary I am saying: 'This is so nice...and here it is different. '...and then I continue this communication...Then I put the middle fingers at the base of the skull, lift a little, tilting the head back and show: 'This is nice!' In this place I lengthen a little, sensing where she feels it...and at that angle it's stuck here [pointing to the middle of the chest] ...The question is: Can I reproduce in her what she felt when she was moving herself with the whole of herself involved...just a little? Now try feeling that from the head with each other in FI. How would you give her the feeling that her head is connected to her body?" The answer "I would..."was always immediately countered by an imperative: " Show me, don't talk." "But I can show you another way and then it's up to you." A particularly fascinating scene developed when a 'practitioner' desperately needed help because her FI partner would not allow her head to be moved from where it had rolled at the beginning. A number of colleagues had a go but the head stayed stubbornly turned to the right. When she took over, Mia asked first of all: "But why roll it anyway?" Then she elucidated the role and importance of the practitioner's intention: " You use the way she is when she comes to you in order to show her something: 'Now look, it's so easy to go there...Can you let me do this...that...and you do what you think is your job at the moment. - If you know what you want you are in charge... She is the client or patient - whatever you want. You are the boss...I may not be able to roll the head but I can move it..." After some complex 'neurological diplomacy' (as Ruthy Alon calls it) Mia continued: " You can choose to be here , there or there ... (showing some viable options) ... You can choose ...So the question is what you choose when you get something like that...It's fantastic learning!...I wanted you to see that and not get frightened when the head is there...and I want to show her: 'Do you want to do this ...live like that?...But I can show you another way and then it's up to you. So let's continue and keep learning." " With what you have already learnt you have such a bucket of possibilities!" When a particularly safe way of supporting the head and neck was demonstrated by an experienced practitioner, Mia emphasized once again: " You must realize that with what you have already learned you have such a bucket of possibilities...and each time you'll find what seems best...and if that doesn't work you do something else..."
hem to absorb the vast experience, knowledge, and understanding which she actively embodies all the time, " showing people how to take responsibility " or " returning people to themselves ".